Sometimes I envy spinners who have a textile heritage. Their mothers taught them how to spin, they spin on their grandmother’s spinning wheel, they learned because everybody did it, that kind of heritage. I have no textile heritage. In this post I will reflect over where our spinning genes come from. I have no spinners in my family. My mother used to sew a lot when I grew up and I inherited that from her, but I know of no one in the family who has had any kind of interest in spinning. My mother may have taught me how to knit (because that is what you did in the -80’s), but I wouldn’t call her a knitter. A 12 year old Josefin knitting. The year was 1985 and I was sitting in my aunt’s summer house garden in Austria. Somepeople are fortunate enough to have a well defined textile heritage. They can point out a person in their life who taught them how to spin or who has in some other way been important to them when they learned how to spin. I have no inherited tools with a personal history, no treasured family textiles, no tales to tell of old hands showing the motions. Some cultures have a strong textile heritage. Perhaps especially cultures where sheep are an important part of the agriculture and the landscape. With the sheep comes crafting that becomes an important part of people’s cultural and personal history. Textile crafting is a natural part of the culture and anyone who doesn’t craft is the odd person. In 2015 I visited Shetland with my wool traveling club for Shetland wool week. Sheep are everywhere in Shetland. I think there are about 10 times more sheep than two-legged inhabitants. The treeless landscape is shaped by the sheep and the infrastructure needs to accommodate for sheep and pastures. Shetland looks like a sheep planet with tiny villages scattered in the landscape for people visiting. Sheep grazing by the Bressay lighthouse, Shetland. East coast of Mainland Shetland in the background. It was of course a wonderful week that none of us will ever forget. But the one thing that made the biggest impression on me was the textile heritage. Every Shetlander knows their textile heritage. And I do mean everyone. Their mothers and grandmothers have knitted when walking and shepherding and whenever their hands were not occupied with something else. Because they had to. Knitted items were sold and used as an important means for trading. Every Shetlander knows what a hap stretcher, jumper board or a knitting belt is. There is a beautiful flora of special knitting terminology with influences from the Norse language and Scots. Hentilagets=Tufts of wool found in the pastures. Sprettin=ripping back (Sprätta in Swedish means ripping up a sewn seam). Makkin=knitting. The textile heritage is tightly woven into everyone’s cultural and personal history. Since oil happened in Shetland, women haven’t needed to knit to provide for their families anymore, but the heritage is still very strong. After having read a review of the book Spider woman’s children in the latest issue of Spin-off magazine, I knew I needed to buy the book. I ordered it, and when it arrived it proved to be a beautiful book that warmly told the stories of Navajo women (and a few men) who spin yarn from the Churro sheep. The wool is spun on Navajo spindles and the yarn is used to weave traditional Navajo tapestry rugs. The tradition is passed down from mother to daughter (or son), as are the textile tools and specific patterns or styles. It is a strong matriarchal culture with a true and genuine respect for the craft and the crafter. Many Navajo have spent a lot of time at trading posts where they have sold their rugs. The rugs are well sought after today and sell for thousands of dollars on auctions. This week I bought the video Andean spinning from Interweave. It features the talented Nilda Callañaupa Alveraz in a gentle conversation with Linda Ligon. Nilda shows how the women of the Andes spin sheep’s wool, alpaca and llama on bottom whorl spindles, pushkas. They spin constantly, and usually very thin yarn for weaving. Hands are never idle and there is always some textile crafting going on. The women spin, ply, dye and weave together and create a textile treasure to take great pride in. Men spin bulkier yarn and often in llama wool for weaving potato sacks. Imagine that, storing your potatoes in handspun, hand woven llama sacks. What a potato feast! Nilda Callañaupa Alveraz tells Linda Ligon about Andean spinning. Short clip from the downloadable video Andean spinning. They spin the wool on simple hand-carved and very lightweight bottom whorl spindles. Just a stick and a whorl. No hook, you just secure the yarn with a couple of half-hitches and you are good to go. They don’t prepare the wool with any tools other than your hands. They just separate the fibers with their hands and turn them into clouds that they drafts from. Another video that shows Andean spinning from unprocessed wool. The process is mesmerizing and my heart was singing when I watched the video. The simplest of tools make the most beautiful, yet sturdy and useful textiles. I instantly felt a need for a pushka spindle. Even as we speak, two pushkas are on the way to me. I intend to get myself a fleece that I can tease and draft directly from without tools. I don’t know what breed they use, but since the Spanish brought the sheep, chances are that there is at least some amount of merino in today’s sheep grazing the Andean slopes. I’m thinking some Jämtland wool or Norwegian crossbred, NKS, will do the trick. Abby Franquemont who grew up in the Andes as a daughter of anthropologists learned the technique from an early age (but shockingly late in the eyes of the locals). She is currently back in Cusco, Peru, and sends daily sweets in the shape of videos from her visit. It makes me want to go to Peru right now and spin with them. Anyone know of a decent train line from Europe to South America? There are places in Sweden with a cultural textile heritage. The county of Dalarna for example is a region where twined knitting has been the dominant textile technique for centuries. Women were knitting whenever their hands were free to knit. Idle hands were a sin. Many people in this region today can show a treasured vadmal jacket with twined knitted sleeves, safely stored in the attic. And they treasure it. My children don’t know how to spin and they don’t share my passion for textiles. But they do have a passive knowledge of spinning and wool. They can tell the difference between a Texel sheep and a Finewool sheep. Probably Rya and Gotland too. They know the names of quite a few of the spindle types I have and they enjoy the sound of the spinning wheel. How many city kids have this knowledge today? Every time I see a sign of this passive knowledge my heart smiles. I know that I have passed a treasured knowledge to them, even if they don’t share my passion. Recently I got a new supported spindle and bowl. The bowl had a metal piece underneath to fit a magnet so that the bowl doesn’t slide off my lap when I spin. The other day I went to the hardware store to get a strong magnet. I had brought the bowl to check if the magnet would be strong enough. When I waited in line I imagined what I would answer if the sales person would ask what the bowl was used for. I imagined answering “the line is too long for me to tell you what the bowl is used for”. I was a bit disappointed when he didn’t ask me. Not even after testing the function with my handspun hat between the magnet and the bowl! But he did get me a decent magnet. Supported spindle and bowl by Björn Peck. Few people outside the spinning community know what they are used for, let alone why I would want a magnet for it. In a culture with a strong textile heritage this situation wouldn’t have occurred. The hardware store would have exposed the magnets in the shop with a sign saying “Get your spindle bowl magnets for safe commuter spinning here!”. Wouldn’t that be something? I wouldn’t say that Stockholm has a textile heritage, at least not one that I know of. I don’t often see textile crafting in Stockholm. Whenever I see a person trying to untangle their earphones on the metro my heart jumps because I instantly think they are knitting. But they are not. The irony of this is that they wouldn’t have had to untangle their earphones in the first place had they only had the knowledge to knit them in! No untangling necessary with knit-in earphones. Picture from 2012. Photo by Dan Waltin. The few times I don’t get around by bike I spin or knit on the metro. First and foremost because I want to, but also to make textile crafting visible. I want people to know that spinning exist. I want people to reflect over what it is that I do, perhaps dig out threads of memories of knitting grandmothers, weaving aunts or just old hands showing how it’s done. Some people are brave enough to ask me what I’m doing, or just seek eye contact and smile. Once I was standing in the metro, nalbinding away. A man in his 60’s was watching what I was doing. After a while he smiled at me and asked “Isn’t that that nalbinding?” I was so shocked I nearly forgot to get off at the next stop. Never have I experienced anyone outside the textile community recognizing nalbinding, let alone a man. I treasure moments like these. They give me hope that I can be a part of passing at least a passive knowledge of textile tradition on. Most of my you who follow me on my blog and YouTube channel are spinners. A few just appreciate the serenity of my videos and another group is fascinated by the textile techniques without an intention of crafting themselves. Recently one of my videos was spread in a non-spinning context. In one week the amount of viewers grew from 600 to 21000 (!) and is now up in around 36000 views. Spinners are my target group, but seeing so many other people appreciating my textile heritage makes my toes dance of joy. I may not have a textile heritage. But I have made my own. The positive side of not having a textile heritage is that I don’t have a given thread to follow. I’m not expected to follow a pre-destined tradition. I make my own thread and my own discoveries based on my curiosity and love for the craft. That is a heritage I am proud of. What is your textile heritage? The featured image I chose for this post is a Flemish tapestry weave made by my sister-in-law’s grandmother Birgit. Birgit was a weaver and left tons of hand woven pieces when she passed away. My sister-in-law does have a textile heritage is by her grandmother and mother, but she is not a textile crafter herself. When she was sorting out her grandmother Birgit’s belongings she thought of me and gave me a whole bag with beautiful handwoven kitchen towels and a few tapestry weaves. This way I can say that I have adopted my sister-in-law’s textile heritage. There is a lot going on now. I need to make a to do-list and try to sort out my thoughts, ideas, musts and want tos. Trying to sort out thoughts, ideas, musts, need tos and want tos. There was a lot of attention on my latest post on calculations. So many people seem to have heard that question before, “will you knit me a sweater? I’ll pay for the material cost.” Apparently, it is an important discussion – about the value of women’s work, the appreciation and recognition of hand crafted items and the history of textile production. The post has been shared over a thousand times and it has been read by ever 3500 people in all continents in just a few days. That is amazing and totally overwhelming. That’s how I feel right now, overwhelmed. I am thrilled that so many people read the post. I am so happy that so many people recognized the frustration of investing so much time and love into a craft that few people understand the skills behind. But I’m also exhausted by the attention. Overwhelming does that to a highly sensitive person. A lot of people liked the sweater too (and the whole blog series). And world of wool linked to the sweater in their newsletter, fancy that! Many people asked for a pattern for the sweater and I will make one. Soon. When I have had some time to breathe. Over 200 people have taken the free course in How to pick a supported spindle and bowl! I have got so many lovely reviews. People really like the structure of the course. The most interesting concept in the course has been the shape of the upper spinning tip and its impact of ergonomics. I should launch my new course soon. Just need to check a few technical stuff first. I wonder if anyone would come if I did a live webinar. I should ask my followers. Hosting a live webinar would most definitely be really scary, but I think it will be good for me. Not everything can be edited and well polished. Oh, and I need to ask the students of the free course to check their spam filters. Perhaps my emails have got caught there. I wonder what course I will make next. Perhaps my followers have suggestions and requests? Navajo spindle spinning, supported spindle spinning, consistency, fiber preparation? Yeah, that would be the best thing, to ask them. After all, it is for my followers I make the courses, they should know what courses they want. Perhaps they want the opportunity to get a private video coaching session? That would be so cool! It feels good that secret article 1 is finished. It will be published soon, that’s so cool! Gotta get to work on secret article 2 too, and especially secret pattern x, that will be a challenge. I need to plan the photo shoots too. I’ll put the pattern, the article and the photo shoots on top of the to do-list. Secret pattern y can wait a while. I don’t think it will be a very complicated one to write, though. Lots of secret stuff going on! Video shooting season starts soon. Well, depending on when spring will really come. We’re still in mid-winter. But I do have some material from last summer that I haven’t released. I should edit them before I start shooting new videos. And there is that secret video project coming up in May, together with my spinning friends A and M. That will be a lot of fun! I have two in-person courses to plan too. The supported spindle course series in Stockholm in March and the five-day course at Sätergläntan in July! I like the concept – a spindle a day. Just got to figure out how to bring all the different spindle types for all the students on the train. I really need to spin. Need as in my mind needs the serenity and time to recharge. And to get in a mode of creative thinking. Yeah, that’s what I’ll do right now, by the fireplace. Do I have to go to work on Monday? If it is too slippery to take the bike I can knit on the metro! And knitting at coffee breaks is always a conversation starter. In many spinning or knitting projects people have asked me how much time I have spent spinning, how much raw fleece it takes to spin a certain amount of yarn, how much a skein would cost etc. I have often wondered this myself. In this post I will take you through all the calculations of my recently finished fleece-to-garment project. This is the fourth post in a blog series. The first post was about how to find the superpowers of a fleece and in the second post I talked about consistency. The third post was about design from fleece to garment. Through the blog series I use the wool from one sheep as a case study. I started with two fleeces from the same sheep, one spring shearing and one autumn shearing. I had given parts of both to a friend, so none of them were complete fleeces. But an estimation is that I had around 1,2 kg of raw fiber before I started the project. I spun the yarn with English longdraw. For each draw I treadled 4 + 10 treadles. Darn it, I didn’t count how many long draws I did for each rolag. But there was a lot of treadling! When the last singles had been plied I had 12 skeins of roughly 60 g each. 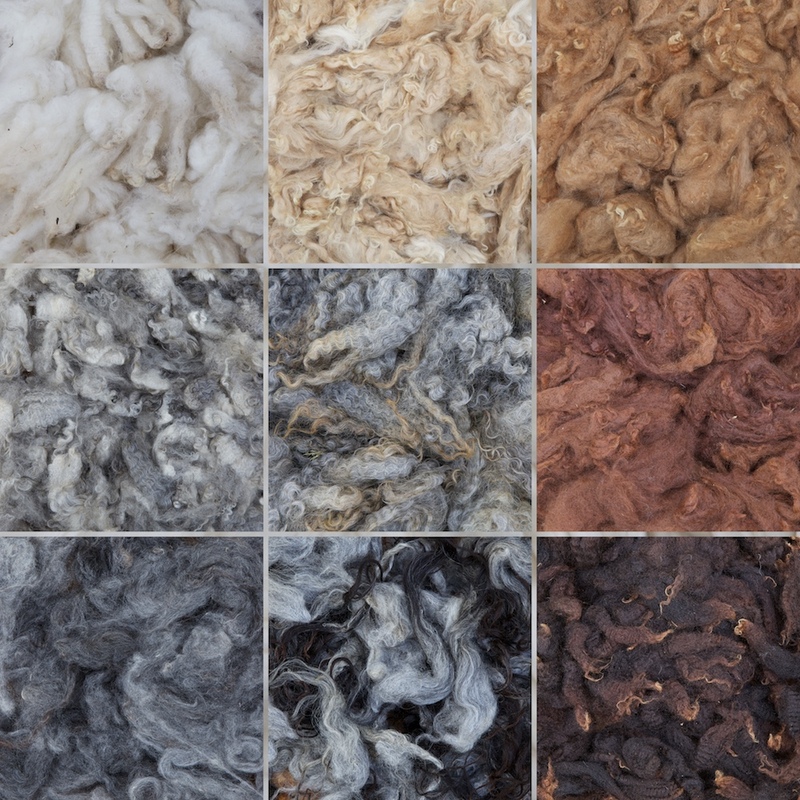 The total weight of the skeins was 700 g. Total length: 1270 m. 700 g of yarn from 1200 g of wool makes a yield of around 58% of the weight of the fleeces. My average yield is around 55 %. 12 3-plied skeins with 48 rolags in each skein makes 576 rolags, carded with a total of 10368 strokes. Roughly. It took 8 skeins to knit the sweater – 830 m and 440 g. Still, it is light as a cloud and feels like a second skin. Or my very own fleece. For time calculations I tried to make an estimation of each part of the process from fluff to stuff. For example, I knit for 20 minutes and weighed how much I had knit during that time and multiplied it by 3 to get the knitted weight per hour. Oh, and the embroidery yarn. Let’s add another 4 hours for that. Knitting per hour: 21,6 g. Total weight of the sweater was 440 g, so an estimated total time for knitting is roughly 20 hours. Plus embroidery 2 hours. Ball winding by hand, 2 hours. Add to that designing, swatching, frogging, pattern calculations, blocking etc, an extra 10 h. That’s roughly 80 hours for one sweater. “I know you love knitting, how much for a sweater? I can pay for the material cost!” How many of you have heard that before? My usual answer is, “Tell me a decent hourly rate and I’ll tell you how many hours it took to knit it.” You know where I’m heading, don’t you? A few years ago Pia Kammeborn, Queen of Kammebornia, calculated the cost of a pair of mittens. The post is written in Swedish but the gist of it is: It takes her around 20 hours to knit a pair of half mitts. Textile crafts (or women’s craft) have never really been paid fairly, so Pia’s calculations are based on an average hourly rate for typical male crafts. With an hourly rate of 600 Swedish kronor/ 60 €/ $67, which is what a craftsman in a typical male craft like plumbing or carpentry would earn, Pia’s mittens would cost around 12000 Swedish kronor/ 1200€/ $1320. “I know you love renovating kitchens, will you do mine? I can pay for the material cost!”. Nobody ever said that. Does that mean men’s work is worth more than women’s? Well, that’s just wrong. Back in 2011, Dan and I renovated our bedroom. We considered asking Dan’s father (who built his own house) to help us, but instead we did it ourselves. Together. We still asked Dan’s father to help out, but as a baby sitter. Photo by Dan Waltin. Back to my sweater. We landed in 80 hours totally from fleece to garment. With the same calculations as in Pia’s example that would land in roughly 48000 Swedish kronor/ 4800 €/ $5280. Or, if you are short on cash, a skein for 3000 Swedish kronor/ 300 €/ $332. Two of the fleeces were championship winners and I bought them at the auction following the competition. I paid around 800 Swedish kronor/80 €/ $88 for all three fleeces, so an estimation for the cost of the material for the sweater is around 500 Swedish kronor/50 €/ $55. That’s less than the rate per hour in the calculations in Pia’s example above. Less than 300 Swedish kronor/30 €/ $33 for one fleece is way too cheap, considering the all the work invested by the sheep owner. But that is another story and for a shepherdess to tell. So basically I’m walking around at work with a sweater worth 48000 kronor! But I can’t be the first person to having done that. Or, well, 48500 to be more exact if you include the material cost, but that’s just a fart in the universe in this example. I’m just waiting for someone to ask me what I will charge for a sweater. I’ll take the bait without hesitation, like a crocodile in the river, unannounced – BAM! – 48000 kronor. I can say that I would charge 48000 Swedish kronor for a sweater. I know nobody would buy it, though and I won’t sell it. My husband tried to convince me to sell a pair of nalbinding mittens on e-bay for 20000 Swedish kronor just to make a point. But I would never knit or spin for money. These things are my babies. I know many people need to sell their handspuns and hand knits. And I know the discussion about pricing handspuns – and fleeces – pops up every now and then in the spinning forums. Even if nobody will buy handmade textiles with the calculations above it is an important discussion. As a hand spinner and/or hand knitter you can always charge at least a little more than you think. Like a baby crocodile. Chances are, the more people pay, the more they will appreciate the time, skill and love invested in handmade textiles. This was the last post in this blog series. As always, I have learned a lot from writing the posts and reflecting over what I am doing and why. I hope you learned something too. Through my years as a spinner I have made lots of projects where I spin for a garment. This time I take the process further and make my own garment design, based on the superpowers of the fleece. In this post I look at design from fleece to garment. This is the third post in a blog series. The first post was about how to find the superpowers of a fleece and in the second post I talked about consistency. In the remaining post I take you through some calculations. Through the blog series I use the wool from one sheep as a case study. When I designed the yarn in this case study I worked with the superpowers of the fleece. I wanted to take advantage of the characteristics of the wool in the finished yarn. By listening to the wool and let it tell me how it wanted to be prepared and spun I could allow it to become its best yarn. I wanted the same for the design of a garment – to let the yarn be the star of the garment. So I designed for the yarn. Meet the Margau beta design. I wanted a simple pattern with both knit and purl elements. An advanced pattern like cables or lace would take the focus from the yarn too much. At first I was playing with the idea of stockinette stitch with panels of garter stitch. This idea didn’t work very well, since garter stitch fills out the thickness of the fabric and takes from the length. Stockinette and garter in the same row would therefore result in a bubbly structure, which I didn’t want. Instead I came up with simple panels of stockinette and reversed stockinette. The smooth stockinette shows off the shine in the yarn and the reverse stockinette reveals the roundedness of the 3-ply and the colored specks from the sari silk. I love the look of a raglan yoke. It looks very flattering and knitting in the round suits me as a process knitter. Top-down knitting is what first comes to mind for me, but I wanted to try bottom up this time. I knit the sweater seamlessly with a no-ease fit and waist shaping. Neckband and cuffs in garter stitch. The main part of the body of the sweater is knit in stockinette. At the front and on the sleeves there are panels of reverse stockinette stitch. The waist shaping is all made in reverse stockinette side panels. The panels pass the sleeve in the front and back and go between the raglan yoke shapings. I decided I wanted som assymetrical bling on one of the side panels. I spun a yarn from another finull/rya mix breed, also a winner (silver medal) at the Swedish fleece championships and also from shepherdess Margau Wohlfart-Leijdström. She knows what she is doing! This finull/rya mixbreed, however is more rya-like in its character. The staples are long, shiny and quite straight, but also soft (lamb). Long, soft and shiny staples of a finull/rya mixbreed. The fleece was the perfect candidate for an embroidery yarn, and extra special since it was from the same flock as the main fleeces. I combed the staples and spun with short forward draw into a 2-ply worsted yarn. I had plans to dye it in a light turquoise and a medium turquoise, but the colors turned out all wrong for this project (dyeing is not one of my superpowers). Beautiful colours, but just not for this sweater. I ended up using the natural white only. The embroidery pattern is simple flowers in chain stitch. I placed them randomly on the left side panel and let them continue on the left front raglan panel and end mid-neckline. I have never embroidered on a knitted garment before and I was very careful not to stretch the embroidery yarn. The chain stitch is in itself has some ease. I didn’t stretch the chains since I wanted the rounded shape of a flower petal. that way it works quite well even on a garment with no ease. I will try to design the second design top-down. I think it will make the yoke fitting easier. The neckline needs to be a bit more rounded and I will experiment more with short rows. I do like wide raglan panels, but I think they will benefit from being a little slimmer. That will probably make the transition between front and back look better. The front panel can also be a bit slimmer. That will probably make the yoke area look better. To make a better balance and fit, I may put a panel at the back too (in this design the back is all stockinette). The sleeves are a bit too tight and will benefit from a little more ease. I am playing with the idea of making some sort of pattern in the side panels, perhaps also in the front panel. To fit a pattern, the side panels need to be a bit wider at the waist. I just need to spin some more yarn first. I am very happy about this design and I wear the sweater with love and pride. Coming up: The last post in this blog series is about calculations. I will summarize the work with this fleece with some interesting stats! Wip series: Finished twined knitting mittens! I have finally finished my twined knitting mittens! This is the fifth and final post in my wip series of spinning for and knitting a pair of twined knitting mittens. The previous posts are about preparing, spinning, plying and knitting. I am very happy with the result. They were a true joy to knit. But, as always, there is a melancholy and a sense of loss when finishing a project. There are so many thoughts in a project. Practical thoughts like the next step in the project, how to avoid mistakes, but also all the thoughts that float around in my mind in the making. Things I hear, think or experience while I make are things that are captured in the thread and, literally, woven in to the fabric. In this sense, the finished item is so much more than a pair of mittens. It is a sparkling weave of skill, experience, memories, thought processes, love and emotions. And I treasure them all in my wooly, twined knitted treasure box. Even if I miss the process of making, I do get to relive all the emotions and sensations that are a part of the mittens. Every time I wear them. Twined knitting does take a lot of time to make, but the reward is such a sturdy and strong fabric. And once I was over the initial novelty of the technique (which isn’t all new to me, but the last time I did twined knitting was in 2010), I found a nice rhythm of knitting, twining and untwisting. I used 2 mm needles, which was perfect for this yarn. As you can see, the fabric is very dense on the surface. When you turn the mitten inside out you can see the beautiful ridges, caused by the twining. These also add to the density of the mittens. The inside of the mittens show the beautiful ridges created by the twining of the two working yarns. When I first read the pattern I was a bit sceptical to the yarn requirements – 60 g per mitten seemed a lot to me. After a while I started worrying about having spun too little yarn! But when I had woven in the last yarn end I did have some yarn left, just enough to make a handful of pin loom squares. I used a basic mitten pattern from Berit Westman’s booklet Tvåändsstickning. She has a lot of examples of charted chain path patterns. For the cuffs I made a simple xo pattern from the book. This doesn’t show very well even after blocking. For the back of the hands I wanted something special, so I made my own pattern. I wanted the mittens to represent all the strong and talented textile workers through history. When I had finished the chart, I realized that it was International women’s day, which was very suitable. I struggled with the thought of felting the mittens for extra strength and durability. I had felted my first two pairs of twined knitting mittens. But already at the spinning stage I got a strong feeling of the wool being really prone to felting. It was quite sticky in all the parts of the process and I handled the yarn very carefully. I feared that if I felted the mittens, there was a strong risk of over felting. Also, since I had worked with the structure and colour of the yarn from the very beginning, I wanted the yarn to be the star of the show. I do love the variegated colour of the yarn and it looks beautiful in the mittens. Especially in the pattern parts. The mixture of greys and the light golden brown gives the fabric a lovely depth. I am a sucker for greys! As you can see in the pictures of the finished yarn, It was quite loosely spun and plied. This goes hand in hand with the wool, that was almost straight. I did over ply the yarn after it was balanced, to compensate for the unplying made by the twining. I don’t think it would have hurt to over ply a little more than I did. I think this is the most even I have ever knit. I think it is easier to make a more even and tight fabric with twined knitting than with regular knitting, since it is easier to pull the thread after each stitch. Also, I love the mixture of plain twined knitting and the blocks of pattern knitting. The squiggly horizontals are well matched with the straight verticals. The pattern and the colour variations really make the wool justice. When I was preparing the wool and saw the black guard hairs I was afraid that the mittens would be itchy. But they are not. It is just that silky feeling of the under coat. The guard hairs just add a strength bonus. That’s a well behaved yarn! When I wear the mittens I pet the silky ridged insides with my hands. I feel rich. All in all, I think these mittens are in the top five of myfavourite hand spun projects and I smile every time I wear them. I feel proud and humbled to have the knowledge and skills to create something like this, like thousands of women (and a few men) have done before me. What is your favourite hand spun project? Spring is coming and it’s a happy mitten day! Spring is taking its sweet time in Sweden this year. We’re almost at spring equinox and it was -8°C when I got up this morning. It does get warmer in the sun and the birds are singing very spring-like, but there is still snow and degrees below zero during a big part of the day. My whole being is waiting for spring to happen. I long to get out and craft. I have videos to shoot, outdoor knitting to be enjoyed, distaffs to carve and a whole allotment to cultivate. But it’s still too cold for the lanolin and my hands and I can’t put seeds in a frozen ground. So I do what I can. I’m knitting away on my twined knitting mittens. It is a slow and mindful knitting and I love how the whole range of greys are displayed in the fabric. I had my outdoor knitting premiere the other day (featured image), listening to the birds chirping and the dripping of melting snow from the roofs. It was quite lovely. I finished spinning a fleece that had been waiting for over 18 months to be spun. It was a soft and beautiful Värmland fleece. But it had quite a lot of second cuts and vegetable matter. It was also very dark and difficult to see when preparing and spinning. All these things made me reluctant to spin the fleece. At the same time I felt guilty about not spinning it. But I finally gathered my energy to do it. It turned out to be quite a nice (wheel) spin, despite the dark colour, and I turned into four skeins of strong and lustrous warp yarn. The Värmland 2-ply warp yarn, 186 g and 306 m (four skeins), about 1600 m/kg. I also finished an in-hand spinning yarn, the one I started in this video. It is the same fleece as in the twined knitting mittens, but I used the shorter staples and spun them woolen from hand-carded rolags. It came out quite differently compared to the twined knitting yarn. 2-ply Värmland yarn, 45 g, 105 m, 2300 m/kg. Spun woolen on an in-hand-spindle from hand-carded rolags. I found my way back to a rigid heddle weave I started before Christmas. It it yet another pillowcase (such a good practice project). This time in 3-shaft. The warp is 2-ply Leicester, worsted spun (wheel) from hand-combed tops and then dyed. The weft is Shetland singles, spun from hand-carded rolags on a Navajo spindle. It was lovely to weave in the spring sun in the kitchen, but I really wanted to be able to weave outdoors. I am planning this season’s videos. There are lots of ideas in my head – more in-hand spinning of different kinds and in different environments, perhaps some flax spinning. I have promised a video on how I spin English long draw on a spinning wheel. I am also thinking something towards mindfulness and meditation. I’m also planning to make online spinning courses. This is a bigger project and it has to take its time to get a good result. A lot of you are far away from me and my local courses and this is a way to solve the distance issue. If you are interested in taking an upcoming online course, please let me know what you would like and how. There is still time for you to make requests for upcoming videos. What would you like to see learn, explore? Do you like what I do? Then head over to my Patreon page and become a patron. If you become a patron I have lots of exclusive material in store for you. If you don’t I will still continue with the blog and make videos, just as I have before. The twined knitting mittens are in progress! It’s a slow knit, but I knew that already. And the reward is a sturdy, strong and windproof textile, and, of course, a quiet moment of making. I read in my Ravelry notes from my last twined knitting project that it would be a good idea to overply the yarn, since the yarn is unplying a little when the yarns are twisted. So before I started casting on, I ran my balanced yarn through the spinning wheel and overplied it. Hopefully it’s enough. Casting on for twined knitting takes three yarn ends, one dark cast-on yarn and the two working yarns. After casting on there are four ends hanging – the ends from the two working yarns and the two ends from the cast-on yarn. The easiest way to weave these in is to make a braid out of them. This is a pretty detail, as well as practical for hanging up the finished mittens. To prevent the material from curling, it is a good idea to start with a couple of rows of crook stitch (alternating knit and purl stitches with the purl thread in front of the work). I did four rows and then I started an xo pattern and finished the cuff with another eight crook stitch rows. I’m planning a pattern stitch for the back of the hand and a plain palm side. I really enjoy this knit. I love the yarn and the structure that develops. I can’t stop feeling the softness of the yarn and the magical texture of the fabric. I shot a short video of the knitting. I put the baking table in my lap as a background and a flexible knitting light wrapped around my head like a crown. My husband looked at me very quizzically. Still, the lighting arrangement did its job and was successful. As you can see, it is a slow and a somewhat fidgety knit. Both yarn ends come from the same ball of yarn and every now and then I have to stop and untwist the ball. But I get into the rhythm and enjoy the moment. Towards the end of the video I show you the wrong side of the work. The horizontal lines you see on the back of the knit rows is where the yarns are twined. This makes the fabric sturdy. If you hold up a regular knit fabric to the light, you see the light through the fabric. This does not happen with a twined knitting fabric, it is really dense – and I’m using 2 mm needles, which would indicate the density of the fabric. I think it will be a while before I write the post on the finished mittens, I will enjoy the slow knitting and the feeling of the progress of wool yumminess in my hands. Earlier, I wrote about my new spinning project. I am spinning a yarn counter-clockwise to be able to knit myself a pair of twined knitted mittens. The current status is that I have finished one spindle of s-spun singles, about 30 grams. According to the pattern book, I need 100–120 grams, so if I make another 3 30 gram singles I will end up with one 60 gram skein for each mitten. With twined knitting it is av very good idea to knit both mittens at the same time. This to make sure that the gauge turns out the same. I did not do this with my first pair. I have to say It is not the easiest spinning I have experienced. The fiber is impressingly smooth and silky, but there is a certain amount of tugging. I think it has to do with the preparation – I comb the locks as lightly as possible, just to separate the fibers. I guess they are still a little attached to each other, making the drafting a little challenging. But I get the effect I want, and I really enjoy spinning counter-clockwise with my left hand. I love how the colour variation turned out. There is a spectrum from almost white, through silver and light grey to medium and even dark grey, and some strokes of golden brown. Spinning the locks one by one, I was hoping to catch as many of the shades in the fleece as possible. I would not have been able to achieve this effect had I combed the wool in the traditional way. Also, a yarn like this is not possible to machine spin. This will truly be a unique yarn, which warms my heart a little extra. Happy spinning, both clockwise and counter-clockwise! I love grey wool. There are so many possible shades from just a combination of black and white fibers. And the combinations within combinations gives me a whole universe of sparkling silver. I can look at a grey yarn for ages and get mesmerized by the spiraling promise of everlasting variation. Also, I have discovered the wonderful world of dyeing on grey. The colours turn out so deep and rich and gives the yarn a beautiful heathered effect from all the shades in the grey. Which, of course, puts me in a dilemma – I want to keep the beautiful grey and at the same time dye it for the wonderful colour result. At Christmas, I bought a beautiful fleece from talented wool classifier Kia Gabrielsson of Ullsörvis. It was a grey Trønder fleece with lots of different shades in it. I separated the fleece and ended up with four piles of grey, from anthracite to very light grey. I carded the fiber and spun the colours separately and 3-plied them. The result was four squishy skeins of yummy greys. I also found the perfect knitting project for the skeins, where I could use all the shades and show the beautiful variation. It was the Slouchy shrug by 伊凡 陳, Yarn door on Ravelry.